As the chilly fall season settles onto River Vista, Idaho, County Seat restaurant owner Angie Turner looks forward to cooking with the new farmers’ market bounty of freshly grown produce. In fact, testing a variety of potato poutine recipes is why she almost forgets that she’s committed to volunteering at the local homeless mission. Doing good for her community is actually secondary to Angie’s main objective, which is checking out the man who is running the mission and dating Felicia, her best friend and restaurant partner. Angie can’t help but distrust the intentions of trust fund baby Taylor Simpson, although it’s another volunteer who truly sets off all of her alarms. Professor Daniel Monet seems to have too cozy a relationship with his student Hope Anderson, and Angie is more than a little protective of her dishwasher and aspiring young chef. Indeed, when Daniel is murdered that night and Hope’s fingerprints are found on a wineglass in his home, she becomes the primary suspect and the target of gossip linking her to his proclivity of affairs with attractive students. There’s no question that Angie’s going to allow Hope to be railroaded into prison, even if the sheriff happens to be the uncle of the man she’s dating. Angie’s not feeling too enamored of Ian McNeal at the moment anyway, as her boyfriend failed to notify her that he was abruptly returning home to England with a mission of his own. That means that Angie’s on her own as she rather brashly interrogates the late professor’s coworkers and investigates the mystery behind of a man without a past and who didn’t seem to exist before coming to teach at Boise. What becomes so apparent in this series is how closely Angie connects food to love and family. Her fondest memories are associated with family meals, and she loves nothing more than replicating that within her beloved County Seat restaurant. Her staff has truly become her family, which is why Angie may act a little too recklessly when she feels they are being threatened. The romantic relationships of the characters come under focus when Angie and her friends are forced to evaluate what constitutes a healthy and equal partnership, but mostly it all comes down to priorities and open communication. Angie’s newfound love of poutine is made tantalizing even for readers who never may have realized such a dish even existed, and she experiments with creative ways to top this Canadian dish of potatoes and cheese. The mystery swerves into an unexpected direction as Ian brings home new information, and Angie never hesitates to follow up on these clues. Her ever-growing St. Bernard puppy Dom continues to battle with Precious the goat, making Angie’s domestic situation as unique as one could expect. 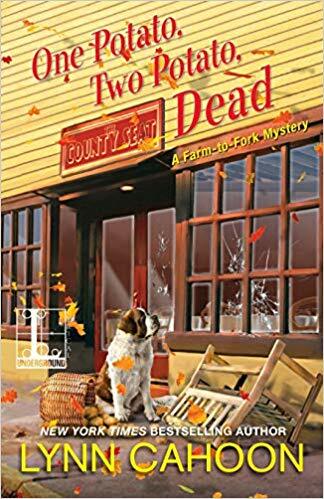 Romance, comfort farm-to-fork cooking, and strong bonds of friendship continue to make this an entertaining and fun mystery series. To enter to win an ebook copy of One Potato, Two Potato, Dead, simply email KRL at krlcontests@gmail[dot]com by replacing the [dot] with a period, and with the subject line "potato,” or comment on this article. A winner will be chosen April 20, 2019. U.S. residents only. If entering if via comment please include your email address. You can read our privacy statement here if you like. Check out other mystery articles, reviews, book giveaways & mystery short stories in our mystery section in Kings River Life and in our mystery category here on KRL News & Reviews. And join our mystery Facebook group to keep up with everything mystery we post, and have a chance at some extra giveaways. And check out our new mystery podcast which features mystery short stories and first chapters read by local actors! I really liked the description of the book. Sounds like another great read from Lynn Cahoon. pulls my attention immediately. Thanks for including Lynn and her book on your blog.